Have your civil rights been violated by law enforcement officers or public officials? Have you been deprived of your rights under the New Jersey Constitution or New Jersey law by a law enforcement officer or public official? If you believe you may have a claim of violation of your New Jersey civil rights, contact our New Jersey employment lawyers to assess your situation and diligently pursue violations of your civil rights. Every individual in New Jersey enjoys the free exercise of his civil rights which are guaranteed and secured under the New Jersey Constitution and federal Constitution. In order to protect and assure against deprivation of these rights, a remedy exists when a law enforcement officer or public official interferes with the civil rights of another. 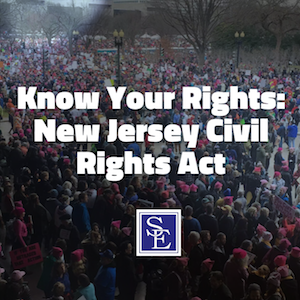 The New Jersey Civil Rights Act was enacted in 2004 and provides an avenue to vindicate substantive rights guaranteed by federal law and New Jersey’s Constitution and laws. The New Jersey Civil Rights Act recognizes two types of private claims: 1) a claim when one is deprived of a right, and 2) a claim when one’s rights have been interfered with by threats, intimidation, coercion or force. The New Jersey Civil Rights Act is modeled on the federal civil rights law which provides for a civil action for deprivation of civil rights. It is important to note that the New Jersey Supreme Court has explained that the New Jersey Civil Rights Act and federal Civil Rights Act protect against different violations. The New Jersey Civil Rights Act protects against the deprivation of any rights, privileges, or immunities secured by New Jersey’s Constitution and laws, whereas the federal Civil Rights Act provides remedies for the deprivation of both procedural and substantive rights. The New Jersey Civil Rights Act is not a right itself, but is merely a vehicle through which to vindicate a substantive right. For the purposes of the New Jersey Civil Rights Act, “substantive” addresses those rights and duties that may give rise to an action, whereas procedural addresses the manner and means by which those rights and duties are enforced. Violations of procedural due process are not covered by the New Jersey Civil Rights Act. The individual against whom an New Jersey Civil Rights Act claim can be made must be acting “under color of law” meaning he or she must have acted within his or her capacity as a law enforcement officer or related public role. Any deprivation, interference or attempt-to-interfere with one’s rights, may provide for a private right of action against the law enforcement officer. Law enforcement officers sued for violations of the New Jersey Civil Rights Act may assert the affirmative defense of qualified immunity. The qualified immunity doctrine provides government officials with an affirmative defense to shield them from a suit for civil damages when their conduct does not violate clearly established statutory or constitutional rights of which a reasonable person would have known. Discretionary law enforcement functions are shielded from civil liability insofar as their conduct does not violate clearly established statutory or constitutional rights of which a reasonable person would have known. The defense of qualified immunity is available when a plaintiff asserts a claim for money damages under the New Jersey Civil Rights Act; it does not apply to claims for injunctive relief. To determine whether qualified immunity applies, New Jersey Courts must analyze: 1) whether taken in the light most favorable to the party asserting the injury, the facts alleged show the officer’s conduct violated a constitutional right; and 2) whether the right was clearly established at the time of the defendant’s alleged misconduct. For a right to be clearly established, the contours of the right must be sufficiently clear that a reasonable official would understand that what he or she is doing violates that right. A court must inquire to the facts of the specific case, not generally, to determine whether qualified immunity applies. Qualified immunity is determined by the court, not a jury. In addition to any damages, civil penalty, injunction or other appropriate relief awarded in an action brought in a New Jersey Civil Rights Act claim, the court may award the prevailing party reasonable attorney’s fees and costs. If you believe your civil rights have been violated, please feel free to contact our New Jersey Civil Rights Act lawyers to discuss your matter.